Ever wondered why GoPro’s flagship camera is called “the Black” but has always been silver or gray? Well, with the Hero 7, the company has righted that wrong. Cognitive dissonance aside, there are a few other things fixed with this year’s update, but the big question is: Are they the issues that matter to you? If your frustrations center around shaky footage or wrangling your videos onto social media, then yes. If you were hoping for a laundry list of new video modes then, maybe not so much (4K/60fps is still the max). There is a little something here for everyone, though, and — importantly — it keeps the $399 price tag of the Hero 6 it replaces. The question this time seems to be: Can it replace your phone (camera)? The Hero 7 might not come with a host of new shooting modes or imaging improvements, but it does come with a few key tweaks that make it exciting to new and old users alike. The upgrade in stability alone will save hours of potential memories from the trash can. SuperPhoto makes the GoPro a more robust choice for stills, and the addition of live streaming is a plus for everyone. 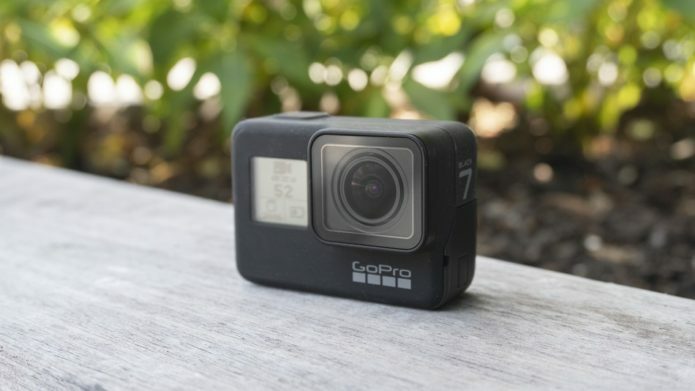 We’d always love to see significant bumps in the battery life, but given the Hero 7 launches at the same price as the Hero 6, it basically means the best GoPro just got better without impacting your pocket. Upgraders might want to consider if there’s enough new here for you, but for everyone else, the Hero 7 improves on an already winning formula. The first, and in my opinion the best, update to the Hero 7 Black is improved stabilization (which GoPro calls HyperSmooth). Sony introduced optical stabilization to its action cameras in fall 2016; GoPro followed suit with the Hero 5 soon after. 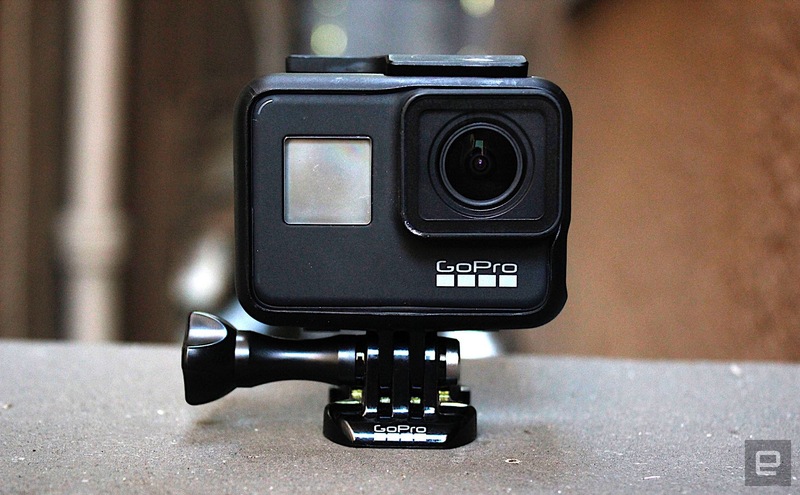 The big difference was that GoPro used electronic stabilization (EIS) rather than optical. That difference is important, as optical stabilization happens at the source (the lens), whereas EIS is done in-camera. Purists tend to prefer anything that doesn’t alter the image once captured. This was borne out, but the fact that the Hero 5’s stabilization was better than none, but still caused visible artifacts (Jell-o effect), usually around the edges of the scene. Things improved with the Hero 6, but there were still some issues, usually when you make sharp movements (a common occurrence with an action camera of course). Enter the Hero 7. 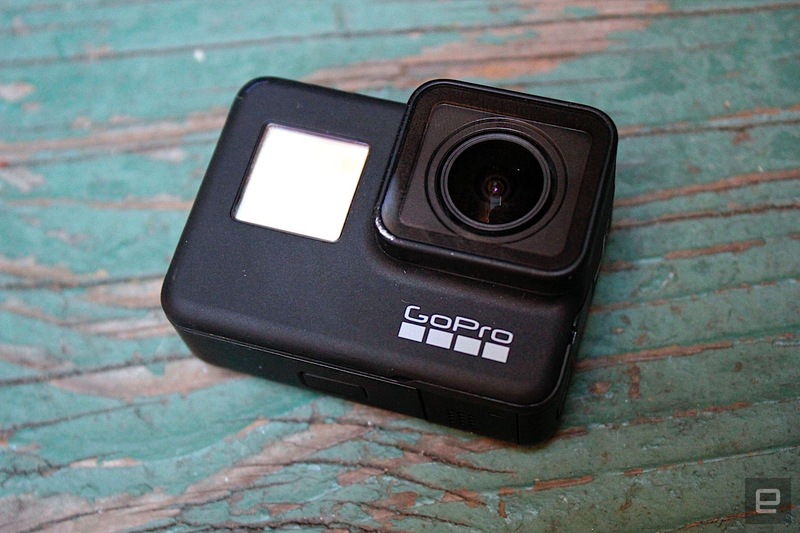 The bad news (sorry, purists) is that GoPro is sticking with EIS. The good news is that it’s a solid improvement from the Hero 6 and light years better than the Hero 5. GoPro (predictably) claims that EIS has advantages over OIS: lens movement has a physical hard rail it can’t go beyond. With EIS, the software has more leeway. 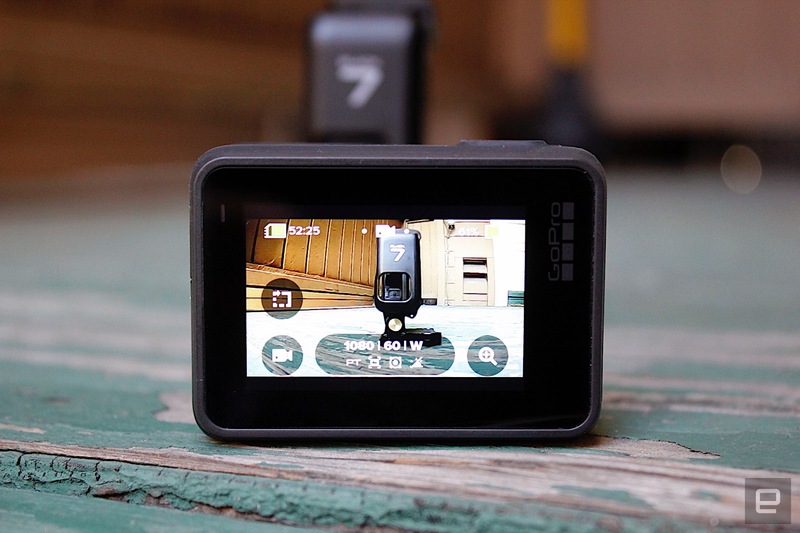 The Hero 7’s stabilization works by using the predictive smarts of the GoPro’s GP1 processor. 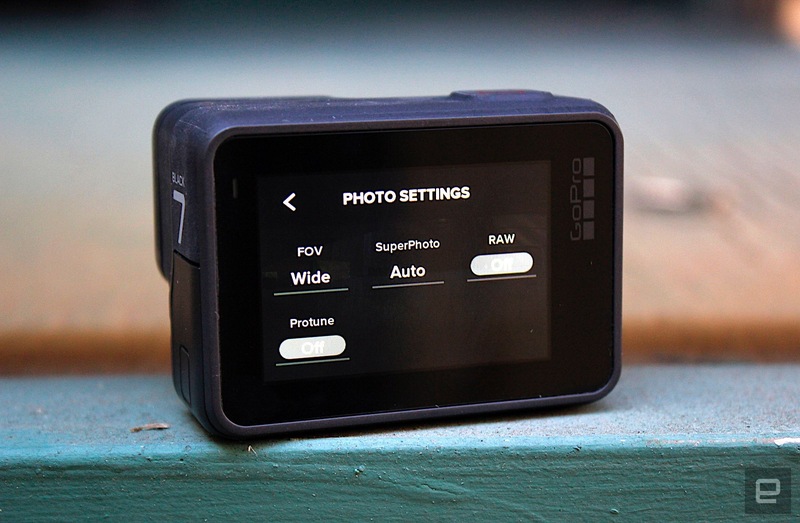 The camera preempts your swerves and keeps the image free from dreaded jerks and jitters. Without a doubt, it is much improved and something that will save hours of footage from hitting the trash folder. I tested the Hero 6 side-by-side with the Hero 7 in a number of situations (walking, skateboarding etc. ), and the Hero 6 is prone to occasional jerks that feel like overcorrecting and some general jittering. These same movements don’t appear in the Hero 7, but there is still some natural movement, which you wouldn’t find with a gimbal (this is a positive or a negative depending on the “look” you want). Ultimately, movement is expected if you’re being active; a gimbal can smooth things out in a way that’s not natural. With both cameras mounted on a skateboard, riding on slightly bumpy concrete, the Hero 6 had noticeable “rumble,” the Hero 7 still had some (thanks, physics) but the resulting video is much easier to watch. Why is this my favorite new feature? Because this one thing — shaky footage — is really the deal-breaker between an OK shot you might share with friends, and something that looks smooth and ready for the world. There are some more specific benefits, too. I’ve long wanted to be able to do something simple: walk with a GoPro and wear a lapel mic. It’s a basic task, but something the camera wasn’t really designed for. With the Hero 7, for the first time, I think they’ve cracked it. You might not want to do this exact thing, but the fact that you can is a good indicator that things have improved here. What all this does is make the GoPro much more versatile. If you can grab a smooth establishing shot just with the GoPro in a grip, you no longer need to fumble around with gimbals (or carry them with you). 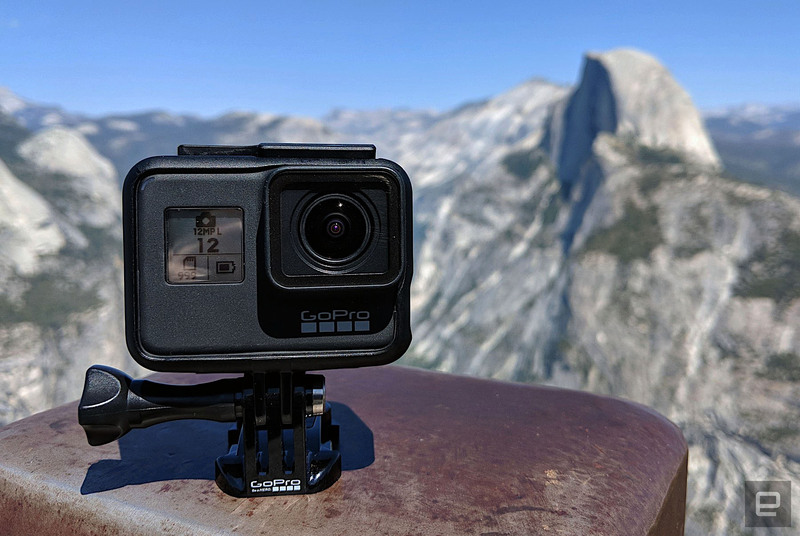 Given that you can turn the GoPro on and start recording with one touch, you can be a lot more spontaneous, with the odds of ending up with something usable much improved. If you like to shoot in “Linear” mode (which corrects the “fisheye” effect), then the stabilization is even better. HyperSmooth is more effective when the image is cropped (as it is in Linear mode). This happy coincidence means your shots are both more stable, and less warped — hard to argue with that (though not everyone is a fan of cropping). GoPro is calling HyperSmooth “gimbal-like.” The idea is you can ditch your hand-held stabilizer. For most situations, that’s true — the internal stabilization is going to be enough. But comparing it to a gimbal might even be selling it short. There’s something robotic about the way gimbals glide and pitch that isn’t always ideal for action footage. Also, we can all agree that not having to mount a gimbal on your noggin is good for everyone. You might think the stabilization in your iPhone or Pixel is pretty good, but your phone doesn’t like water or rough-and-tumble — so the Hero 7 might just be the camera you reach for more often in a number of scenarios. With the mobile-user in mind, it’s a good time to talk about the next main update to Hero 7: live streaming. You’ve been able to wrangle a video feed from a GoPro live to the internet for a while, but it was limited (or laborious). Now, it’s as simple as firing up the GoPro app on your phone and clicking a button. Right now, you’re limited to Facebook or RTMP(which can be piped into YouTube etc. ), but more native options are coming. This one is potentially a huge deal. Live video is a feature popping up everywhere, and before the Hero 7, GoPro likely wasn’t your first choice. Now that it’s a native feature, and given the camera’s rugged nature, you can expect to see a wave of people showing off their vacation, adventure and travels in real time. Sure, you could already do that with your phone, but again, you can’t put your phone nearly as many places as you can a GoPro. Sadly, you do still need your phone… so no live surfing shots just yet (though that’s not impossible), but the next time you go out for a track day, or horse riding or a vert session, you can beam it to the world in real time from your helmet, car or, well, equine friend’s perspective. It’s worth circling back quickly to the stabilization; the two make quite a team. The GoPro Hero 7 can now go toe-to-toe with your phone as the life-blogging camera of choice. Previously you might have stuck with your phone for its connectivity (and convenience), but the Hero 7 Black offers enough extra versatility, that it can free up your phone (which remains safely in your pocket). A dedicated camera for in-the-field reporting, live streams and action feeds is arguably better than relying on your precious phone alone. You have been able to shoot time-lapse video with a GoPro since, basically, forever. That was great for static shots (think: people dashing by on a sidewalk). If you wanted to shoot one while moving, it was a bit of a gamble as to how it might come out. TimeWarp solves this. If you’re familiar with Instagram’s HyperLapse you’ll be right at home here. 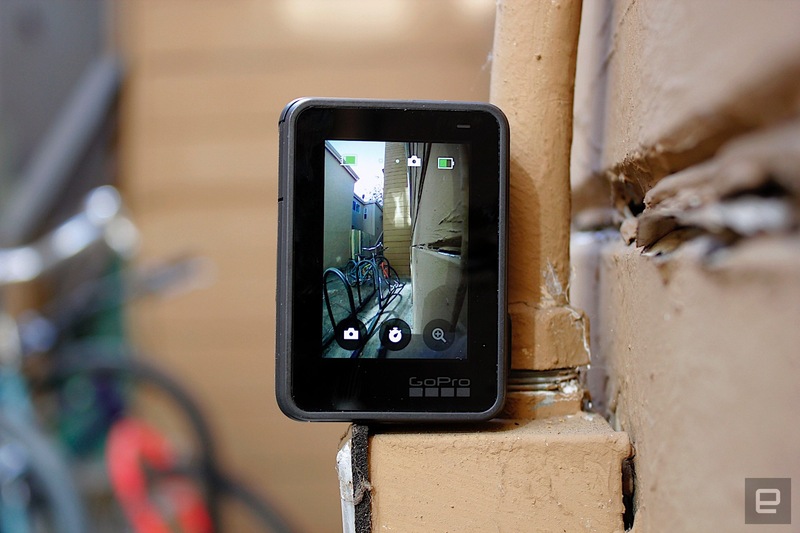 In short, it adds stabilization to a time-lapse for smooth, time-crunching videos. It’s great for showing off more mundane parts of your adventure (a long hike) in short bursts. I tested it on the switchbacks of a trail in Yosemite, and it’s a fun, simple and effective way to add variety to your footage. As with regular time-lapses, you can adjust the “speed” (photo interval), just with TimeWarp, you select how much you want to rev things up (2/5/10/15 and 30 times normal speed). At first, it’s a little weird. The camera looks like it’s recording (a solid red dot on the display), but the timer crawls along — because it’s showing you the length of the resulting video, not the length of time it took to record it (which makes more sense, of course). You might never need TimeWarp, but there will be plenty of people who welcome the addition to the toolbox. I hinted in the intro that there wasn’t a host of new shoot modes. TimeWarp might appease the video lovers, but for the photography crowd, there’s SuperPhoto. The hyperbolic name is really code for “better” HDR. This, along with stabilization, is a feature that’s been here before in various forms (WDR in the Hero 5, and HDR in the Hero 6). This time around it claims a whole new method of layering/processing your images — local tone mapping rather than global tone mapping, to be precise. What this means for you is that your final image includes more detail in areas that the older method might have smoothed out in the processing. I tested this in a number of situations, and the difference is clear. I shot some trees in Yosemite with the sun behind them, and despite that, the details of the bark are visibly clearer than in the same photo with the Hero 6. Similarly, a shot I took from Berkeley looking across the bay to San Francisco presented far more definition on the sun-drenched water and the rocks in the foreground than the older sibling could muster. Other photographic improvements come in the form of a timer right where you want it (on the left of the screen), so you can better compose yourself for selfies (or family portraits by the log fire). There’s also a revamped zoom slider. Digital zoom is always a slight compromise in image quality, but it’s nice to have an easy tool to reframe your pictures from the camera itself. In a similar vein, video mode comes with an option to predetermine the length of a clip. Say you’re about to jump off a rock into the ocean; you could manually start and stop your clip. With the timer, you can tell the GoPro to record only for 15 or 30 seconds. It’s a small touch, but one that might allow you to focus a bit more on the moment and spare your memory card (and save a little time in editing). These little additions are actually part of a broader UI refresh. Before they had displays, navigating a GoPro was a little frustrating. The introduction of an LCD made all the difference, but the Hero 7 tidies up things even more. You’ll still swipe up for your media and down for preferences, but left and right will now switch between TimeWarp/Time-Lapse video and photo modes. The current mode and core settings will be at the center-bottom, and tapping that will pull up advanced settings (like Pro-Tune mode). I much prefer this new layout, as getting to the options that matter seems more intuitive, leaving me less likely to miss the shot. One last detail in the new UI is the ability to shoot natively in portrait. Now, let’s be clear, you could always hold a GoPro at 90-degrees and shoot video or take photos. Just this time around the Hero 7 will rotate the menu along with it, recognizing you are shooting in portrait. I smell the influence of Instagram here, and being able to send a video directly from your GoPro to Stories without manually rotating it is a simple, yet fiendishly smart, move. So far, so software, you might be thinking? At first glance, most of what’s new here does feel like it could be an (extremely good) firmware update. But there are some minor changes under the hood that make the difference. First is the upgraded (SD)RAM (2GB, if you’re interested) that allows much of the above to be possible. The second is a tweak to the microphones that promises more dynamic range. Audio on an action camera is always hard to gauge and somewhat subjective, but it does seem to offer a more robust recording of my voice, with background details more balanced. Of course, there are also the things that haven’t changed. The optics are the same, and there might be a new color but the housing is still nearly identical (bar some minor aesthetic details). This, of course, means the Hero 7 still works with all your accessories that fit the Hero 5/6, so that’s a good thing. Another thing that remains the same is the battery life. It’s never as much as we want, but the positive take is that the new features haven’t made it worse. All of which brings me to, perhaps, a predictable conclusion. Without a doubt, the Hero 7 has a lot more to offer than the Hero 6. With the price remaining at $399, it’s an easy decision if you were already considering plunking down some cash on a flagship GoPro. It’s the upgraders that might have a tougher time. The new features here do have general appeal, but it’s also potentially not quite enough for everyone. The Hero 6 is still a great camera and a decent leap up from the Hero 5 in terms of image quality, whereas the Hero 7 adds some functional features that improve an already good camera. What the Hero 7 does undoubtedly do is open the door a little to a new wave of users. If you live on social or love to share in real time, the Hero 7’s portrait mode, snackable videos, TimeWarps, live streaming and improved HDR images are all going to sing to you, or at the very least, give your trusty phone a run for its money.